Android Studio is a new Android Development Environment with all tools and ADT plugins for developing and debugging the Android programs. It is similar to the Eclipse to use in Windows and Linux. 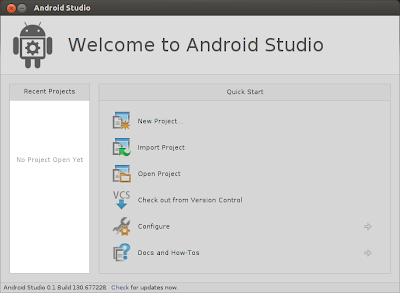 First download the Android Studio for Ubuntu from this link: Download Android Studio . Download the .tar.gz file and extract it in your exact location . Now you need to Navigate the android-studio/bin/ directory in a terminal and execute studio.sh. You may want to add android-studio/bin/ to your PATH environmental variable so that you can start Android Studio from any directory. It's ready and you can start your Android project now. Nice info bro... Thanks. & site continue update garnu paryo..